Resident: "We have remained quiet, cried and suffered in silence"
(CNN) -- Thousands of villagers in rural Alaska are struggling to survive, forced to choose between keeping their families warm and keeping their stomachs full, residents say. 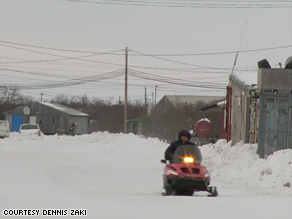 Villagers in Emmonak, Alaska, travel to the store and to hunt by snowmobile now that the river has frozen over. Harvested nuts and berries, small game animals, and dried fish are the only things keeping some from starving. To get to the nearest store, Ann Strongheart and her husband, who live in Nunam Iqua, Alaska, take an hour-and-15-minute snowmobile ride to Emmonak, Alaska. Their town does not have a store of its own. Normally, they would each ride a snowmobile, in case one broke down. But now, they can't afford to waste the fuel, so they just take one and hope for the best. In many stores, 2 pounds of cheese costs between $15 and $18, milk costs $10 a gallon, a 5-pound bag of apples costs $15, and a dozen eggs costs $22 -- more than double the price in the area just two years ago. Many area residents don't even bother with fruits and vegetables, which can be damaged by freezing on the trip home. The trip sets them back about $50 in fuel alone. On top of high food prices, some residents are paying nearly $1,500 a month to heat their homes. The Stronghearts live in one of a group of Native American communities along the Yukon-Kuskokwim Delta. Commercial fishermen couldn't make money from the seasonal king salmon harvest this year, because there was barely enough fish for subsistence. In fact, most fishermen lost money. Then a brutal early winter brought the longest cold snap in five years. In September the temperature in many villages dropped as low as 20 degrees, a record low for many, according to the Alaska Center for Climate Assessment and Policy. The 1,200-mile Yukon River, which the villages use as a highway, froze completely in September, at least two months earlier than usual. That left residents cut off from some basic necessities, and forced them to have pricey bulk fuel flown in. Though they send their kids to school, many speak the native Yup'ik language, and live a much simpler life than even urban Alaskans. They have always had the comfort of food around them -- whatever they can pick, catch and hunt. "But in order to have access to all the subsistence food, you have to be able to get out there and hunt for it," Beans said. And that requires them to go out on their snowmobiles, which means using more fuel. The community is always gathering food, Beans said. "All summer long we are putting away fish for the winter, by fall working on moose, then setting nets under the ice for winter time. But now, this food which used to supplement groceries is all that people have, since they can't afford to buy food at these prices." So residents have been forced to rely more on these subsistence methods. Beans said her brother walks three miles in 20-below-zero weather to check on nets under the ice for fish. The fish is a staple they need to keep themselves fed. "The life out here has always been hard, it's just that its a lot harder now," she said. Emmonak resident Nicholas Tucker wondered if others were feeling the impact, so he broadcast an inquiry via VHF radio, one of the common ways to communicate in the village. Tucker said many residents sobbed as they radioed him back. "His family has been out of food for quite some time now," Tucker wrote about one resident in a letter sent to legislators and the media. "Their 1-year-old child is out of milk, [he] can't get it and he has no idea when he will be able to get the next can." "There are days without food in his house," Tucker wrote. A single father with five children choked back tears as he told Tucker of his struggle to help his kids. "Right now, we can't eat during the day, only at supper time," Tucker wrote of the man. "If there had been no school lunch our kids would be starving." Many of the tribal leaders said they are begging the state and federal governments to do something to help. George Lamont, tribal administrator in Tuluksak, Alaska, said because of the crisis and villagers' inability to pay their utility bills, he fears many may have their electricity shut off. Alaska has given many residents $1,200 energy rebate checks, but residents say it barely helps them with one month's heating costs. The state says its doing what it can to help from food drops to extending the moose-hunting season and is encouraging residents to apply for grants and loans under existing programs. Aid agencies, including the Red Cross, aren't an option right now -- the Alaska Red Cross said they couldn't help unless a disaster is declared. But the state hasn't declared an emergency yet, and it can't because of a state statute that requires the average income levels in the villages to drop below $26,500 -- regardless of the cost of living. "Local government specialists in the state Department of Commerce, Community and Economic Development continue to crunch numbers and seek creative approaches to finding a statutorily acceptable way to justify a disaster declaration, which would open the door to federal aid, as well," deputy press secretary Sharon Leighow said. Leighow said Palin is sending her new rural advisor, John Moller, to the area next week, accompanied by representatives of the Alaska Food Bank. Sen. Lisa Murkowski, R-Alaska, asked the Bureau of Indian Affairs to step in and help the towns most in need. "I find it ironic, tragically ironic, that it takes an economic downturn in the rest of the country for this Congress to consider an economic stimulus for Indian Country," she said during a Senate Committee on Indian Affairs economic stimulus hearing. The villagers hold out hope that the state or federal governments can come through. "People have really been looking forward to some emergency assistance," Lamont said. After hearing the stories from his neighbors, Tucker said it's clear help is needed now. "We have remained quiet, cried and suffered in silence," he said. "So now, this is our simple cry to others for help."